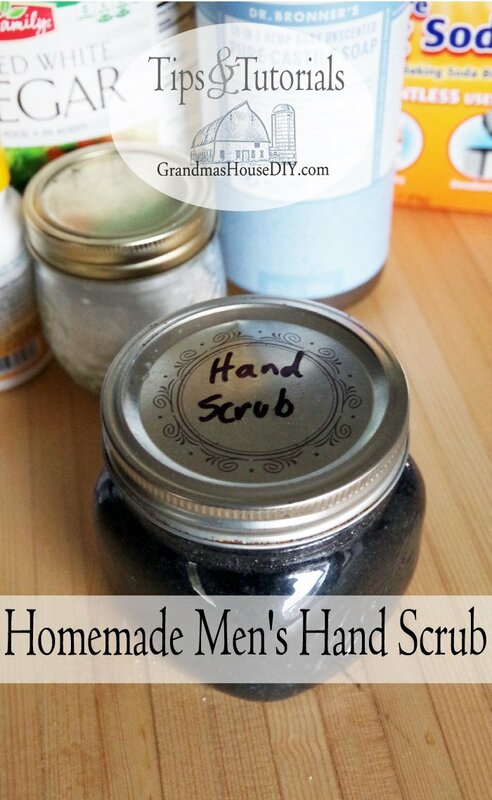 Homemade men’s hand scrub for a gift or for seriously stinky fingers! Of course you do not need to add any essential oil or charcoal but in the end this not only looks manly but it smells manly too and leaves an interesting and light scent behind. (It looks pink in my batch before adding the charcoal because the only salt I keep in our house is pink Himalayan salt that I buy in bulk.) But that’s not really the point of course, the question is: does it work? YES, YES AND MORE YES! Even with my foaming hand soap we had to go back and wash our hands twice after cleaning fresh fish. If we use this men’s hand scrub though (and hot water) its all we need and we only need to use it once. It also leaves our hands totally smooth and soft too. On top of all of that my husband (now ex husband) came in from deer hunting where he had climbed out of a pine tree and totally unintentionally covered his hands with sap. 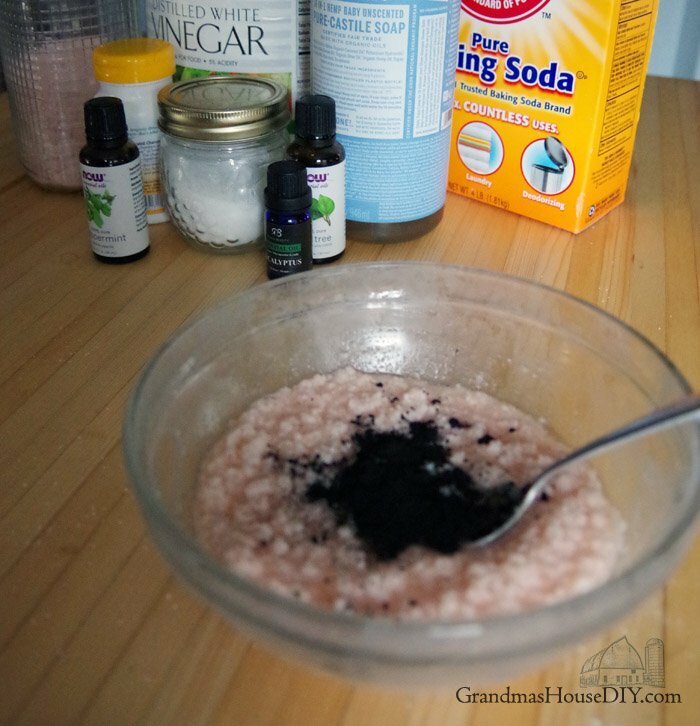 If you’ve ever got pine sap anywhere on your skin before then you know it is incredibly hard to remove. So, he tried this scrub and it took it right off! 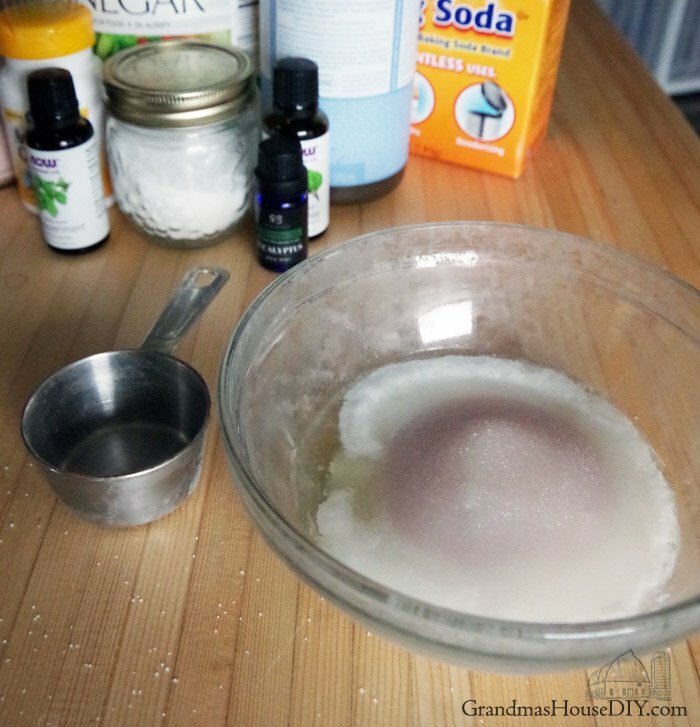 Note here: this is gonna bubble when you mix it all together so make sure and use a bowl a little bigger then you think you need! 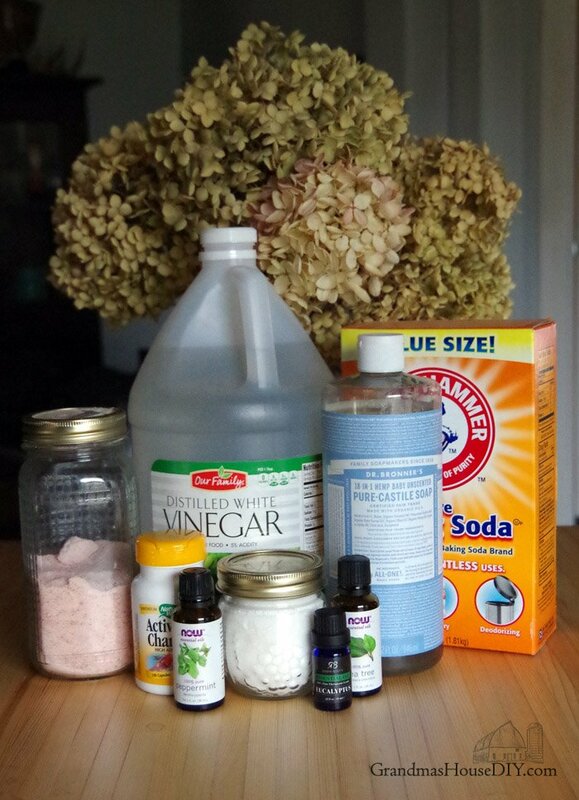 Baking soda and vinegar is what causes the reaction but it calms down quickly and it all mixes up together nicely. 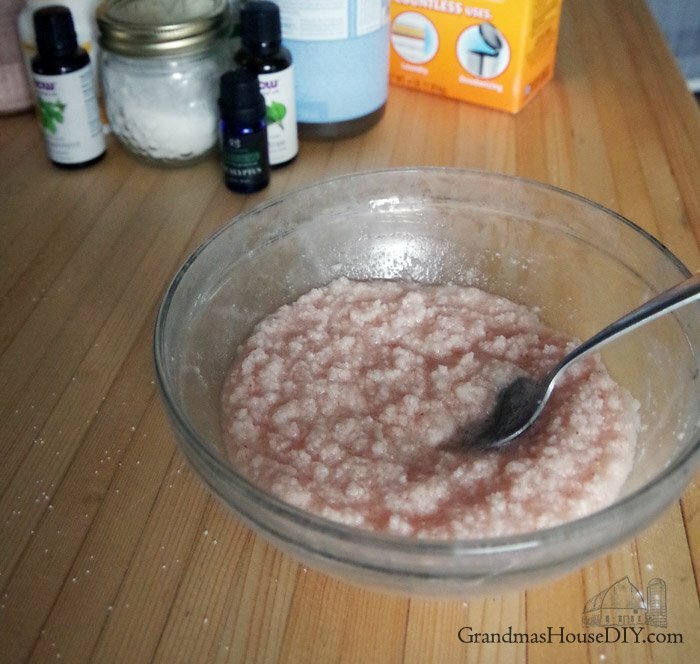 This is a wet enough scrub that you can pour it but I prefer to use a spoon so I can mix it first and then spoon some into my hand. I put a big dollop on my dry hands and really scrub scrub scrub and then I wash it off with hot water scrubbing all the time. Interestingly this stuff really CLINGS to any rough places. I put it in a squat, wide mouthed mason jar. This men’s hand scrub makes a great gift and I’ll definitely be giving quite a few out for Christmas! Hi Tarah! Great post, and I will definitely be making this for myself and my husband. I have sworn off cleaning any fish we brought home as my hands would smell for what seemed like a week after. Can’t wait to give it a try! 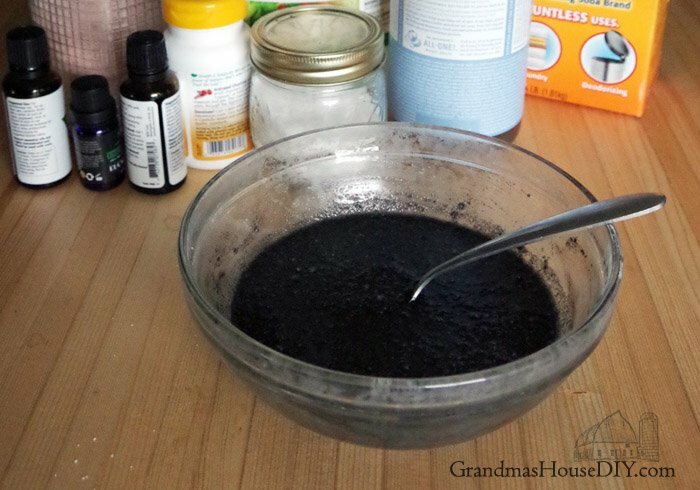 Hi Samantha, I keep a jar of this made at ALL times now because it works so great! Thanks for coming by and commenting! Sara, I think this would really help! My cousin is a mechanic and he tried this and just could not believe how well it worked! Thanks for coming by! 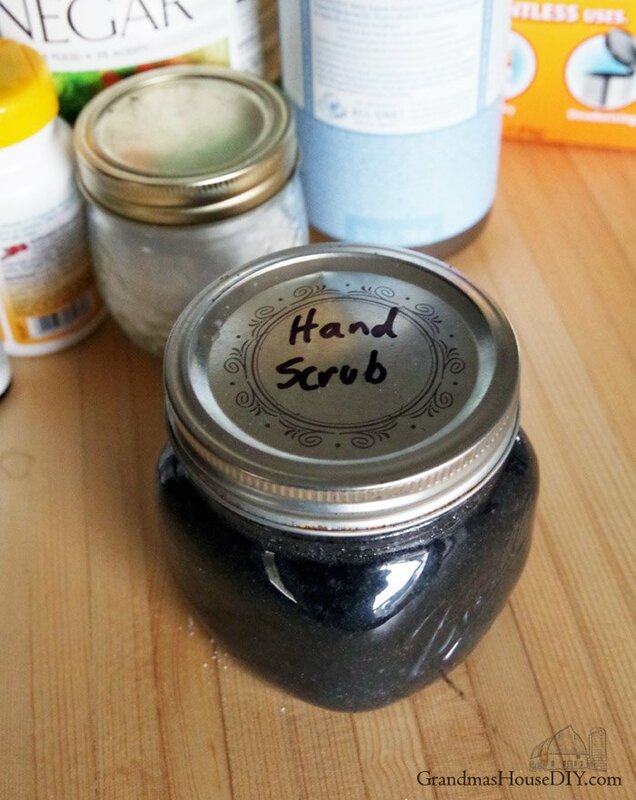 Thanks for sharing this hand scrub recipe! I will share it with my friends who have gardens and hubby’s that go fishing, plus make some for myself. Elena, this stuff is almost miraculous, I keep a jar at my sink at all times now! Thanks for coming by! We could definitely use this around here! Thanks for sharing with Party in Your PJs! Thanks for coming by Lynda! This looks so interesting, I’m bookmarking (and sharing, of course). Hi Tarahlynn this scrub does look a bit strange being black although it certainly looks like it works! Thanks for sharing how to make it with us at #BloggersPitStop and have a fabulous week. Thanks Sue! Yeah I made it black just cause I wanted it to be “manly” lol but you certainly wouldn’t need to add the charcoal. Thanks for coming by! Such a great idea! Husbands need something that they feel comfortable using and mine definitely does not like anything less than ‘manly.’ Love this idea – perfect for my hubby!